So little interesting to say this Saturday. The Equalizer opening is one of Denzel’s best openings, probably his 2nd best ever as the solo lead, unless you count Ryan Reynolds against the Safe House opening. If you do, this could be Denzel’s #1 solo opening ever. The Boxtrolls, which I quite enjoyed – especially Sir Ben Kingsley’s great, nearly unrecognizable vocal performance and 2nd persona as Madame Fifi – is going to be another somewhat soft animation opening for Laika and Focus. Of course, no stop-motion film has ever had a $20 million weekend in the domestic market, so what looks modest from the outside may be as expected by the distributor and filmmakers. The Skeleton Twins is the big indie of the weekend, looking at a weekend just over a million bucks. The other indie with a shot at opening with more than 10k per-screen is IFC’s Days & Nights. Well, it doesn’t look like there will be a feeling other than “blah” about the theatrical box office between the opening of Guardians of the Galaxy on the first week of August and the opening of Interstellar and Big Hero Six the first weekend of November. 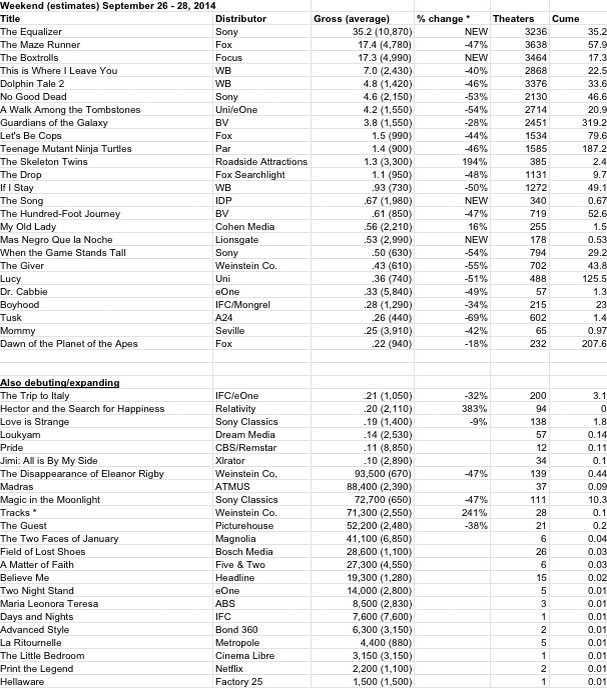 There are likely hits and nice openings (Gone Girl, The Equalizer, Book of Life, maybe Fury), but $50 million-plus openings look to be at least another 7 weekends away. The Maze Runner (“we called it margarine”) will be the best opening since the Mutant Turtles resurfaced on the weekend of August 8. But it’s still looking like it will come up short of the first Percy Jackson film, which was not a big event. Interestingly, looking at the Box Office Mojo chart of YA Adaptations, there is a big gap between Percy‘s opening ($31m) and the next opening, which is The Fault in Our Stars with a $48m launch. 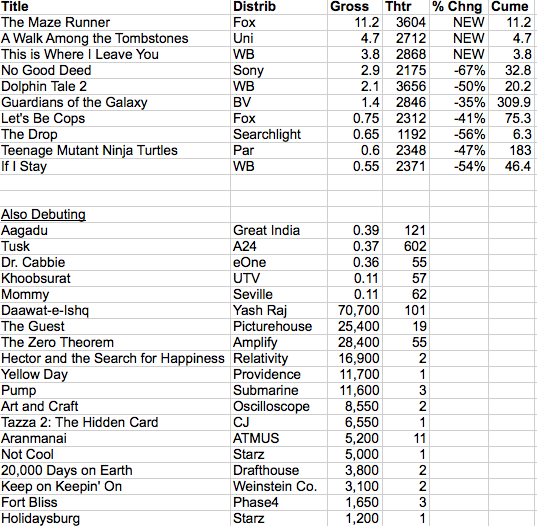 The Top 17 titles, all opening at that $48m or better, all did at least $125m domestic. In the lower half (30 titles opening to $31m opening or less), only two films were leggy enough to get to the $100m domestic mark, Lemony Snicket and The Princess Diaries. It is also worth noting that in that Top 17, it’s all Potter/Twilight/Hunger Games except for the two bottom titles, Divergent and Fault. And This Is Where I Leave You seems to be in the Don’t Tell Them It’s About Jews category and the Sell The Ensemble Not The Movie oeuvre. Neither really draws well. It certainly was the quietest big studio premiere in recent TIFF memory. And indeed, with a boatload of talent (though with due respect to Adam Driver, the hot name of the moment has never sold a movie ticket), a marginal number of people bought tickets yesterday. I saw a Tina Fey interview in which she mentioned Admission and noted, “But nobody saw that.” Expect her to use the line on this film in future interviews. Not a lot of redemption at the arthouse. The big per-screen in limited release will be Yellow Day, which is not another “New Girl” spin-off, but rather another spiritual film. Right behind it will be Hector & The Search For Happiness, a film that I found charming, if imperfect. Lots of new titles riding that $4000 to $5000 per-screen mark this weekend. And Yahoo! reminds us why giving them a trailer exclusive is not a good idea. Not a whole lot more to say about this weekend. The weekend estimates are a bit better than I expected based on Friday estimates. Screen Gems seems to be back in its groove with its third $10m opening in four films released so far this year. Dolphin Tale 2 is another Alcon film, released by WB, that like its predecessor found an audience that studios don’t spend a lot of time working for anymore. Guardians of the Galaxy passes the elusive $300 million domestic mark. Absolutely a phenom. Even though based on a comic, unknown enough to really be seen as an original. Shows how helpful it is to have some free space after your opening. Not as big a hit overseas, though that was the trajectory for Marvel’s Captain America and Thor as well. Teenage Mutant Ninja Turtles will likely be the 9th $200 million domestic grosser of the summer. $350 million worldwide is in range. $400 million would require some very strong performances in still unopened international markets. The Drop is a… not great success. Whether its international cast can drive greater numbers is to be seen. One of the unacknowledged hits of the summer is Let’s Be Cops, which is, I think, the least expensive film released by a studio this summer, and is not only going to do over $80m domestic, but will be over $100m worldwide. Luc Besson’s Lucy, by the way, has almost doubled its domestic gross and is now over $350 million worldwide. Also stronger than the stories out there would suggest was The Hundred Foot Journey, which will pass $50m domestic this week and hasn’t yet started overseas. The Expendables 3 has tripled its domestic gross internationally… but that is because domestic is so weak and is probably still not enough to make the film profitable. 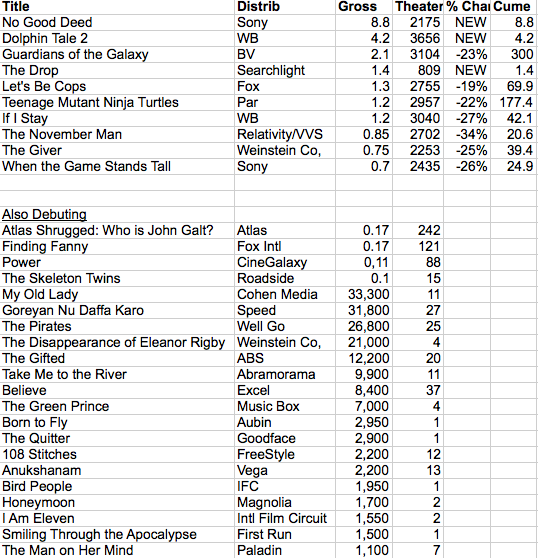 On the indie side, Boyhood is the top limited domestic release (under 1000 screens) of 2014 so far (and of this week), now slowing to under $1m a week with $21.8 million. 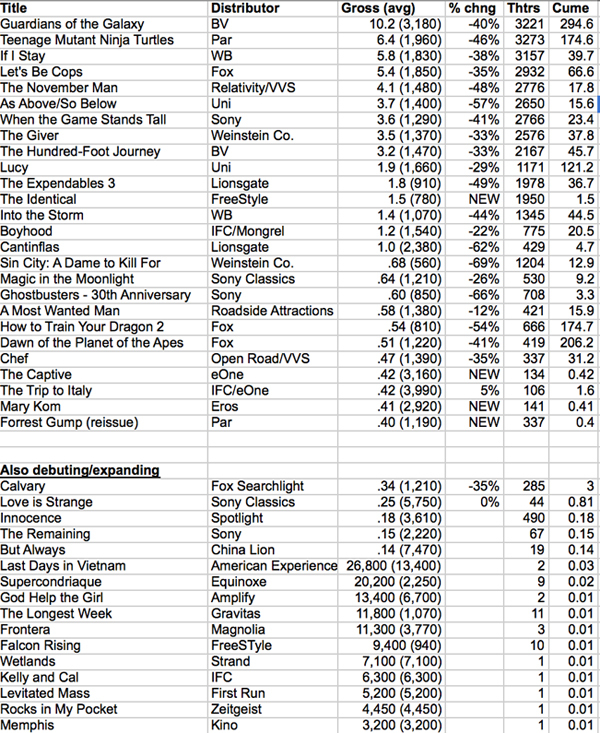 Number 2 indie for the year is A Most Wanted Man, with $16.6m. #3 is Belle, with $10.7 million. 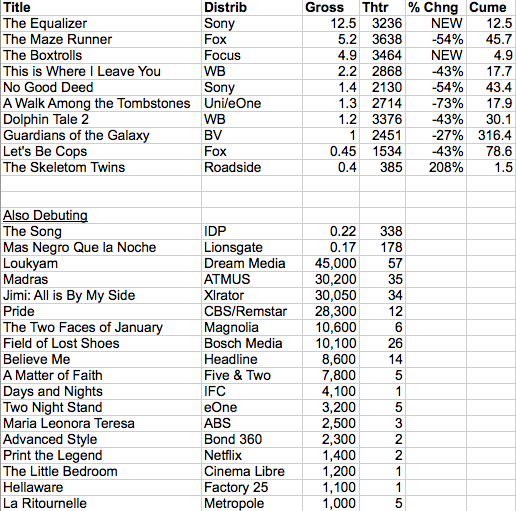 Indie newcomers are led in per-screen by Roadside’s The Skeleton Twins and in gross by Fox International’s Finding Fanny. Before I start pulling apart the meager entries of this weekend, let me note once again… the box office story of this last summer looks quite different when viewed in micro perspective instead of macro perspective. The sky is forever falling for media writers. That is the preferred story. And there are serious issues about what is coming to be deconstructed (especially the rest of the world tending to follow U.S. behaviors a few years later… which will become a major problem if it holds true). But this summer was not a box office disaster simply because overall domestic grosses were “off” $850 million or so from last year’s total summer domestic gross. There was less profit on the high side, but there was also a lot fewer losses on the low side. Ask a studio about the summer and they will concur that it was down, but then ask about the details of their studio and they will tell you that they were not strong as they would like or that they were pretty happy with the results. Here is a simple example, which I do not think explains away everything. But it is specific and it is legit. Animation only. No Pixar movie this summer. Last year released-by-this-date, the 4 animated movies in the Top 20 grossed $2.6 billion worldwide. This year, the 4 animated movies in the Top 20 have grossed $1.5 billion worldwide. The total drop from last year – to date – is about $1.7 billion. 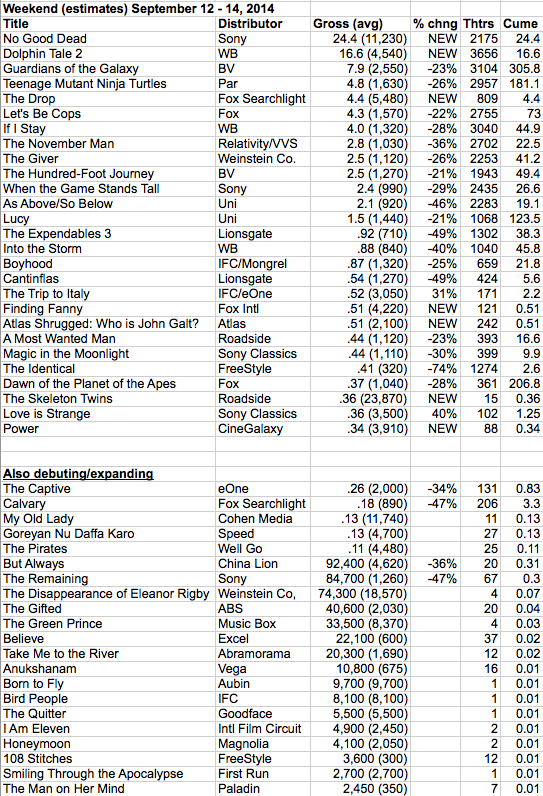 Take out animation and it’s about $600 million… or about a 4% drop… a little above average, but not terribly dramatic. And while you can’t just blink your eyes and change the numbers, a single Pixar movie could have easily been expected to deliver $700 million of the animation sector’s $1.1 billion “deficit” for 2014 or about 40% of the overall “deficit.” One movie. There is certainly a discussion to be had and weaknesses to be poked at, but any disaster that can be fixed by a couple hit movies is not the end of the line for the movies or for theatrical. It just isn’t. As for this weekend, Sony hid No Good Deed from critics and Sony won that bet. The truth is, critics were not likely to damage this film. But why take the chance of a wave of negativity just before opening. Sony found their market – a combination of thriller lovers and people of color – and surely knew they were in good shape going into the weekend and chose not to rock their own boat with no upside. This doesn’t bother me. Never has. Frankly, it’s amazing that studios screen as high a percentage of their films ahead of time as they do. None of these films are culture changers. They are pieces of business. And as such, they are treated as nothing but product, dedicated to their best possible product launch. Dolphin Talk 2 is the sequel to the surprise 2011 Alcon hit that WB didn’t want to fund and though this is not a terribly impressive Friday number, it’s off only 18% from the first film and projects to a $15.5 million 3-day weekend and a possible $60m domestic gross. Like other films, Alcon is surely hoping that the sequel will perform better overseas, where it only did $23 million the first time out. Guardians of the Galaxy finally hit $300 million domestic, the only film of 2014 to do so. It is still #8 worldwide for the year… but will surely get up to #6 or #5 before international plays out. 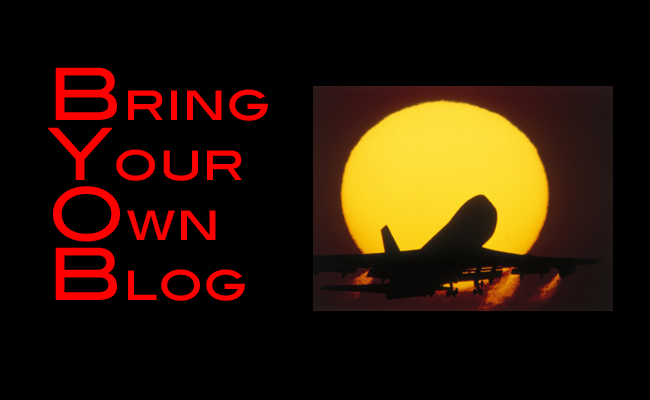 (It is possible that it will get a much bigger Chinese boost… that is the wildcard here). The Drop opens to $1.4 million, which is not good… even for Tom Hardy’s limited history. It opens behind the great Warrior (a box office disappointment) and Lawless. Meanwhile, Let’s Be Cops, yet another summer movie that was written off by most writers on opening weekend, will pass $70 million domestic today. And let’s not forget Tammy, which was overhyped as a feminist issue, but grossed $84 million domestic and was not a summer miss, but rather, a success. These films are victims of hit-and-run journalism, which can’t pay attention to anything for longer than the length of a Twitter trend. On the indie side, Roadside release The Skeleton Twins should get to $20k per-screen on 15… which is okay. The Disappearance of Eleanor Rigby, which gets the record for most worked-over project of the year (leading pretty much nowhere), should do about $15k per on 4 screens and never expand to more than a couple hundred screens (maybe) and half a mil (at most). Even people who hate Harvey Weinstein will have to admit that he game this film a LOT of room to be what indie audiences wanted. But as great as the cast is, this one just loves itself a bit too much to allow others to love it. And My Old Lady, which was at Toronto last week, but didn’t seem to work very hard for attention, will be just under $10k per (as will Born to Fly and The Quitter). A press release came across the desktop today… Michael Barker & Tom Bernard of Sony Classics will be awarded Chevalier of the French Legion of Honor later this month. In a world in which awards are being handed out like candy, one wonders how big an honor any award is. But looking at Wikipedia, I find that they will be only the 9th and 10th Americans in the arts to receive this honor. Wow. That’s quite a list. True, there are two cast members from The Expendables. But aside from those two (and even if you include them), the list is really amazing. And you know what? Barker & Bernard deserve the honor. Over 22 years at Sony Classics, the pair (along with co-founder Marcie Bloom) have been and remained heroes to international film in the United States. There are others that have supported world film quite strongly in the US, but Sony Classics is really the only studio-backed distributor to stay the course, year in and year out. 22 years! Has any other distributor even been run by the same people for that long? Strand’s Jon Gerrans and Marcus Hu have been at it since 1989. But as remarkable as that run has been and as wonderful as Strand is, it’s a different animal. Sony Classics has survived and thrived… part of the corporate universe, but truly independent as well. Part of the success has been being in a relationship with a company that truly understands and appreciates what these guys do. But the luck of the draw only gets you so far… certainly not 22 years in the same ever-evolving situation. So serious felicitations to Big Hockey and The Texas Drawl. There has been lots and lots of water and cranky boaters under your bridge. Welcome to show business. But no one can honestly say that you haven’t earned this unique honor. You have made our culture better, consistently, for a long, long time. Thank you.